Description: A thrilling new urban fantasy filled with magic and motorcycle gangs from Jennifer Rush, author of the Altered saga--perfect for fans of Beautiful Creatures. My Thoughts: Jemmie lives among the kindled but, despite the fact that she has magic, she doesn't fit in. She is so sensitive to magic that it makes her sick. She drinks to mute the effects of being surrounded by magic. This year her town is hosting the annual gathering of the magical familes and Jemmie knows it won't be a good time for her. 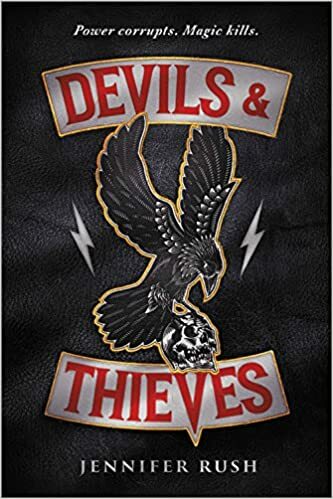 The leader of the Black Devils kindled motorcycle gang is Crowe Medici. He's her best friend Alex's older brother. Jemmie has had a crush on him for years but after a couple of kisses he set her aside for another girl which really raises the tension between them. Crowe has recently taken over the club after the suspicious death of his father. Because he thinks a rival club caused his father's death, there is even more tension at the annual gathering. Meanwhile, to get over her attraction to Crowe, Jemmie has been texting, skyping, and otherwise communicating with a boy named Darek from the rival Deathstalkers club. They met at the previous gathering and have become friends. He is really into her but she still has Crowe on her mind. Things start going wrong at the gathering when people start disappearing. One of the missing is Jemmie's best friend Alex. Jemmie and Crowe have to work together to find the missing people and along the way they learn a number of secrets about each other and their magical world. This book ends with a cliffhanger that has me very eager to read the next book. It had a slow start with lots of world building, Jemmie's relationship with her magic, and setting up the tension between Crowe and Jemmie but, once the action started, it was a fast-paced, exciting story. Sure, I might have magic. I just can't use it. And in the kindled world, that makes me about as useful as a dreck. I received this one in exchange for an honest review from . You can buy your copy here. You've made this one sound like a must read!